People are four times more likely to leave a job because of something going on in the office than for an outside opportunity. 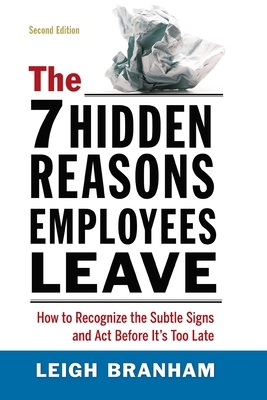 Based on research performed by the prestigious Saratoga Institute, The 7 Hidden Reasons Employees Leave offers real solutions to help leaders overcome the costly problem of employee turnover. The book examines the factors that contribute to turnover--such as manager relationships, lack of trust in senior leadership, company culture, salary, and benefits--and teaches readers how to navigate these obstacles and avoid them in the first place. You'll learn skills such as aligning employee expectations with the realities of the position, avoiding job-person mismatches, and providing feedback and coaching that breed employee confidence. Now incorporating results from author Leigh Branham's "Decision to Leave" post-exit survey, the second edition features new research in employee engagement as well as innovative best practices for retaining employees in a down economy. By revealing what can be done to hold on to the people who provide the most value to the organization, The 7 Hidden Reasons Employees Leave helps leaders increase their teams' morale, productivity--and the company's bottom line.